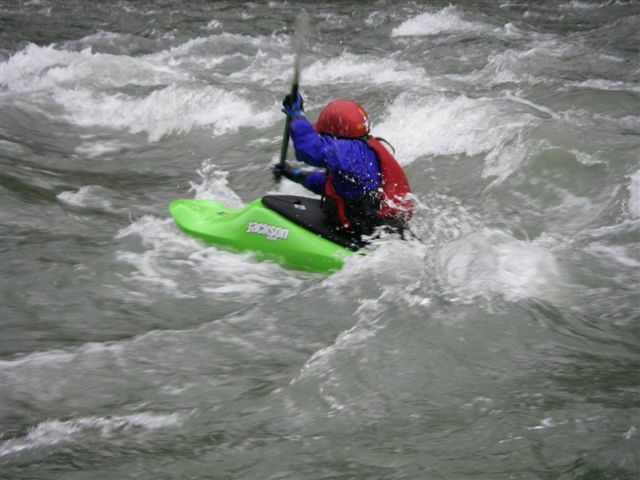 Wondering how to get started whitewater kayaking around the Seattle area? Here’s a rundown of some 2018 classes. I took their Whitewater Fever Class and I think it’s a great way to start. It’s 5 sessions that take place on evenings and weekends so a person with regular working hours can do it, and it includes two pool sessions, which I think is a big deal because in my opinion NWOC is really good at teaching the Eskimo roll and that’s where they do it. In 2018 they’ve got two Whitewater Fever classes, one starting June 4 and the other on July 9. The class costs $240 plus $40 for drysuit rental and $60 for boat rental if you need it. If you can’t make the 5-day class, consider their Eskimo Roll class for $75 which takes place the evening of May 18. You can figure a lot of stuff out about whitewater kayaking on your own watching training videos, but having a good solid roll on which to base your forward progression is crucial, in my opinion. These guys are not afraid to teach the extended paddle grip roll when people are starting out (See Myth 5 on this other post), which from my own experience when used correctly (not as a crutch, but as a training tool that allows people to develop perfect technique) often shortens the learning curve and allows people to more easily fine tune and troubleshoot their own roll when practicing later on, especially if they’re practicing alone. Click here to see the NWOC 2018 Class Calendar. Kayak Academy offers a two-day River Kayaking 101 (RK 101) class that basically gets you ready for Class II river running, covering the basics of getting a kayak where you want to go on flat water on Day 1 and after that involving more current and easy eddies, etc. Cost is $223, with free drysuit rental and all the rest of the gear (kayak, helmet, paddle, PFD, etc.) available to rent for $40 per day. Right now they have classes in March through June 2018, and also in the fall. There’s some rolling/wet exiting refresher practice in RK 101, but they say that it’s not really a “learn to roll” class. Rolling is covered specifically in their RK 103 Beginning Rolling class. It’s a one-time class for $120, with a $25 boat rental fee if necessary. Right now there are none scheduled but you can call them at 206-527-1825 to find out when they may have one. Their 2018 Beginner Whitewater Kayaking class already filled up (early!) but there’s a waiting list you can get on – click here for the class info and standby list. This is an 8-session class, pool and river course for $300, with rental packages for the gear running around $250 (or less, depending on what you already have). I’ve helped out a little bit with this class last year, it’s a really good group and taking a course like this kind of sets you up to have a crew of people who are going to be trying to get out on the rivers after the class, which is always good. Wear goggles that cover your nose, or at the very least goggles and nose pegs. I can swim underwater and open my eyes and not inhale water so I resisted doing that during my first roll class, but I found that being upside down in a boat it turned out to be WAY easier to learn to roll without worrying about water vacuuming itself into my nasal passages. The goal is to learn to roll, and roll well – everything else is secondary. When I took the class, after you flipped over they would teach you to pause a second and then, while already set up for the roll underneath the water, tap your paddle blade down on the surface of the water twice to make sure the blade was above the water. This was super helpful in terms of not rushing the roll and not setting oneself up for failure by initiating the roll when the blade was still beneath the surface. I observed a class a few years ago and I didn’t see all the instructors doing that, there was one guy especially (the only guy out of five people who wasn’t rolling by himself by the end of the class, which is a super high success rate) who I think would have progressed better if they had done that with him. Use a paddle with some feather, meaning the blades are offset. My favorite offsets are 15 and 30 degrees. 45 degrees is a little steep these days, although it was the norm 15 years ago. The guy who I just mentioned was having trouble was using a paddle with no offset, which meant that the way he was setting up with the extended paddle grip in the class his blade was not angled optimally on the surface of the water. I really think if he had been using a paddle with an offset and they had done the water patting thing I mentioned above that he would likely have been rolling by the end of the class. Make sure your boat is reasonably fitted to you. If you’re stretching to reach the foot pegs or the boat is super loose around your hips, the deck is stacked against you! Boats should fit nicely, like a comfy pair of shoes that don’t slop around. At the very least, make sure you’re getting some support from the backband and you can brace against the foot pegs, and your knees are able to tuck into the thigh braces without slipping out and there’s some padding at your hips – without being so squashed in that it’s uncomfortable or you’re losing mobility. Also, when it comes time for your first combat roll (which you will probably not be expecting, seeing as it’s a combat roll :) – here in Washington this will take place in snow melt, so just anticipate that your first reaction when plunked upside down in ice-cold river water and possibly bouncing your helmet off a rock or two might be to FREAK OUT!!! a la Jerry Maguire. This is totally understandable, but if you’re already anticipating that reaction it’s easier to prepare yourself mentally to instead think “Hang on a second”, collect your thoughts and remind yourself that you’re just going to do a roll like you’ve done plenty of times in the pool, and then set up for your roll. Learn how to paddle forward really, really well! This is the most overlooked and in my opinion the most important aspect of whitewater kayaking. I see beginners (and even Class III and IV paddlers) regularly who have a weak forward stroke and/or are doing all arm-paddling instead of using their torso, core and legs. Imagine trying to carve turns on downhill skis on a hill with a 5 degree gradient! Being able to generate speed and momentum is crucial to everything else – carving in and out of eddies, getting to your intended destination in any kind of water, and eventually boofing – it all begins with the forward stroke. So this is not frou-frou stuff, it’s something all the really excellent paddlers have mastered. Well apparently I’m incapable of writing a short blog post. If you have any specific questions about gear or other stuff you’re welcome to send them my way via the Contact page on this blog and if I can help I’m happy to. See You On The River!